Hi, I’m Pyn Stockman and I’m a professional storyteller. I work with and bring to life stories of all kinds. I perform everything from folk and fairy tales to myths and legends. I tell to people of all ages, in all kinds of places: Schools, libraries, hospitals, book shops, museums, woodlands, theatres, festivals and community venues. “The show was like one I had never seen before and it was amazing” Esme aged 6 The Big Sleuth, Birmingham Cathedral. Interactive storytelling performances and workshops for all Key Stages and for those with Additional Needs. Pyn also provides training and CPD for teaching staff, KS4 students, undergraduates and those interested in exploring the art of storytelling. Pyn draws on a repertoire of stories from the oral tradition these can be performed to suit your curriculum topics, literacy targets and are great for arts weeks or for events such National Storytelling Week, World Book Day, No Pens Day, Black History Month and Anti Bullying Week. 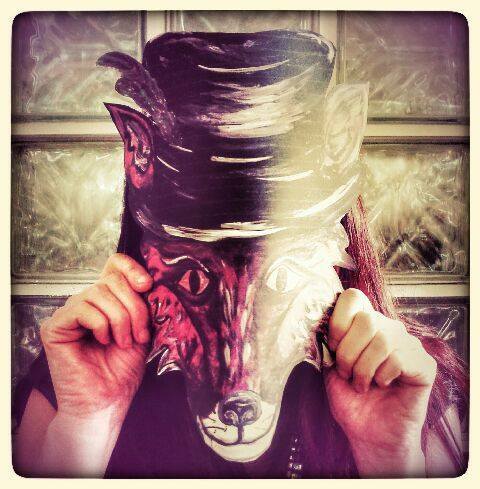 Sometimes the stories involve props, puppets and masks – sometimes they don’t! But they are all fun, interactive and full of adventure and learning…. Pyn works extensively with primary schools tailoring projects and performances to enhance the curriculum and provide a valuable stimulus for creative learning. Also on offer are packages for themed days and arts weeks. Please check out the full range or get in touch to discuss your requirements! Pyn works with secondary schools and out of school settings to create projects that will enhance emotional literacy and explore key issues. Also on offer are workshops to develop young people as storytellers, speakers and performers.Please get in touch to discuss how we can work together. Pyn works with teachers, students, youth theatres, parents, grandparents, youth workers, performers and those interested in becoming storytellers. Workshops offer a blend of narrative development and aspects of performance training through lively, hands on sessions. Interactive storytelling performances and story walks that work well at festivals, in libraries, schools, bookshops and theatre spaces. They last approximatley 40 mins and some use props, puppets and masks. They are lively, dramatic and full of fun and adventure. Pyn’s family friendly storytelling has been described as brilliant, wonderfully lively and always inclusive. Each story is expertly crafted to inspire and engage children of all ages. There are range of storytelling performances, which you can view and book below, but please do get in touch with your particular requirements or just to say Hello! Adventure over frozen landscapes, across wild seas and hot deserts with heroes and heroines of the ancient world to meet mythical beasts and defeat marvellous monsters. These performances are a rich, magical mix of international folk tales, wonder tales, myths and legends. Linked by a theme of your choice or left in the hands of expert storyteller Pyn Stockman. Climb up to the top of the beanstalk with Jack and discover a treasury of stories from around the world when you reach the top. It’s a wonderful view and a whirl of adventures. Told and performed in an engaging, lively style with plenty of opportunities for everyone to join in! Please let me know if there are any particular traditional stories or themes you would like me to include . A fantastic, interactive storytelling adventure! Follow Fox through wild woods and city playgrounds to play pranks with Anansi, make up jokes with Loki, howl with Coyote and make mischief with Monkey. Insightful trickster tales from around the world re-imagined for the 21st century told using masks and puppets. Created for The Summer Reading Challenge 2018 and touring to libraries across the UK. The Golden Apples are missing! Fox has lost his courage and the King doesn’t know what to do. But at half past midnight feast two brave children set off on a journey into the heart of the forest in their quest to find The Firebird. 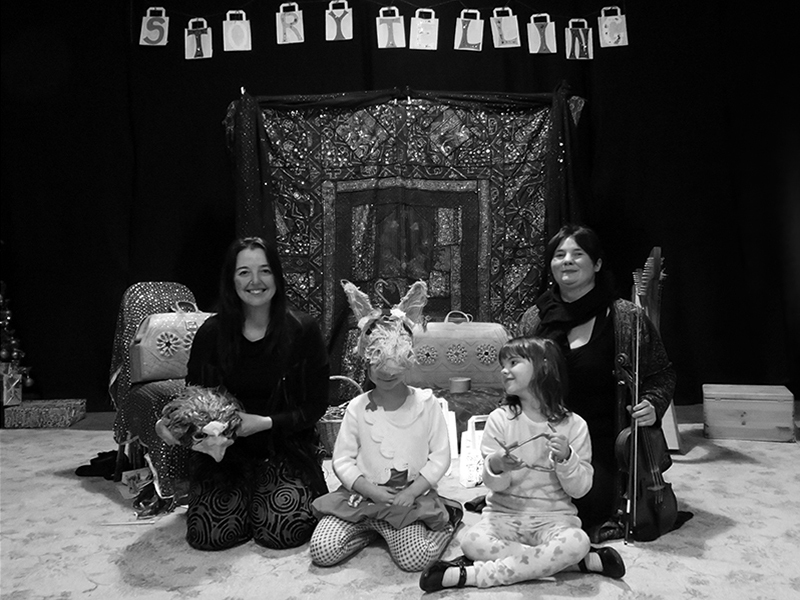 This wonder-filled tale will be brought to life with props, puppets and masks and can include live music from multi- instrumentalist Ann Jones. Follow Vasilisa on her journey into the unknown as she confronts her fears and finds wonder in a forest full of magical animals, a house on chicken legs and wild witches. There’s puzzles to solve and riddles to answer in this delightful, empowering re telling of a classic tale. Told using peg dolls and masks with plenty of opportunities for everyone to get involved. Inspired by the local environment. These lively journeys weave together a range of international folk and fairy tales with local legends for a unique experience. Currently developing bespoke story walks with Birmingham Roundhouse and Secret City Arts. Can also be used to engage visitors with Museum collections, Gallery spaces and historic locations. Magical, mesmerising and often with a dark twist to the tale these performances have been crafted with an adult audience in mind. Performances are sometimes made with a distinct musical element through colIaborations with musicians from a range of backgrounds. The shows are adaptable feasts of words, sounds and visuals. 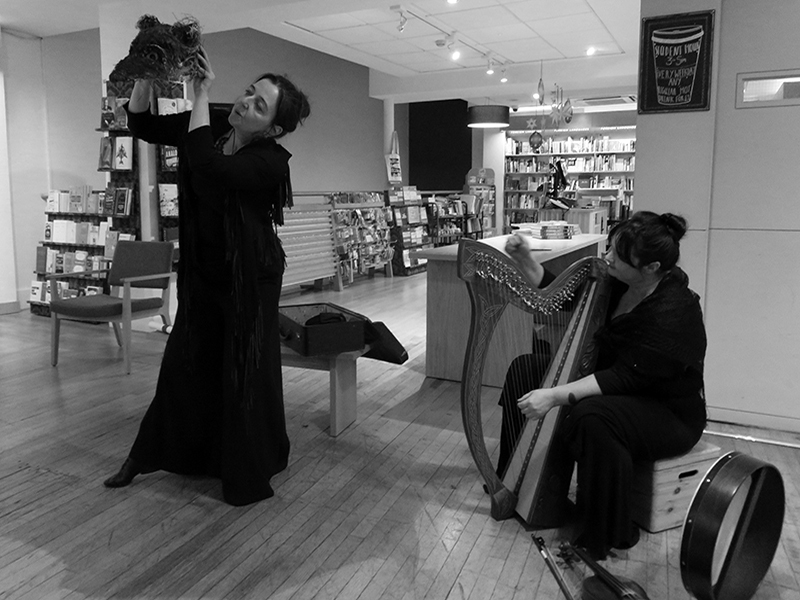 They sit comfortably in book shops, museums, libraries as well as more traditional performance spaces and festivals. In addition to the full length shows Pyn also tells collections of tales from her repertoire to adult audiences and can create something special for your party or event. All work is suitable for ages 14+. Who will play our parlour game? Make your way through the shadowy paths of old folk tales to the gates of Blue Beards Castle. Storytelling using masks and audience interaction to decide the ending. With live music by multi -instrumentalist Ann Jones. A compelling tale of true love, heroic deeds and hilarious characters. A boy is born with luck on his side. A rich man rides into the forest with evil intent. This performance fuses performance storytelling with an emotive Handpan soundtrack from Marc Reck. Lively, dramatic, performances able to fit into any space or location. A rich mix of international folk tales, wonder tales, myths and legends. 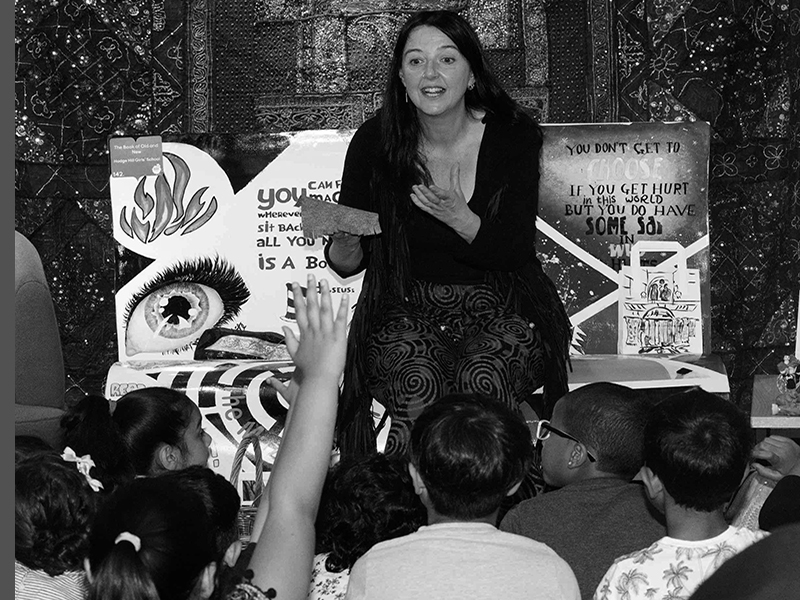 These storytelling performances are drawn from my repertoire and aimed at an adult audience. Please get in touch with your theme or specific request. If you would like to get in touch to book any of the work i do, or to discuss any tailor made projects, i would love to hear from you.